Personality: Silvia is a naturally charming and playful girl and easy to get along with. She can be a flirt and a tease at times, but often those never go too far as her upbringing steered her away from her succubus blood, though her mind is not entirely innocent. That being said, she has her cheeky and malicious side which often brings about trouble, both to herself and her object of interest, however most of the time she is harmless and only out to cause mischief. She is very protective of her friends and family and would do everything she could to keep them safe, even if she knows she will get hurt by doing so. This is partly because she knows that she heals faster than most, and can tolerate the pain, so she wouldn't mind such a sacrifice. Truthfully though, she secretly enjoys the pain. She is selfless when it counts, but she can be just as selfish when chooses to. When she sets her mind on something, she will slowly work towards it, and at the same time, wouldn't be too discouraged by any setbacks. As a side note, she enjoys cross-dressing from time to time. Silvia stands at a height of 5'9" with a slim build. Her hair is silvery white with a very light hint of purple. 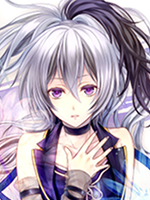 A bundle of her hair is colored a dark violet and hangs off to the left. She usually wears her hair in a ponytail, however she also lets it down when its too cold. She also sometimes cuts her hair short whenever she cross-dresses as it gives her a bit more masculinity. A careful choice of clothing also helps to keep her femininity hidden. She has a pale complexion and deep violet eyes. 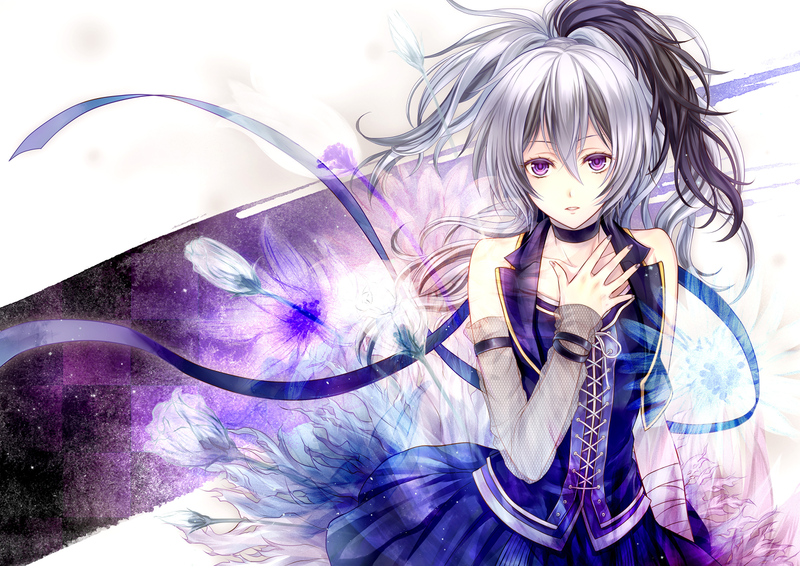 Her usual clothing are gothic in appearance and mostly in a dark violet color. Though it doesn't mean she doesn't wear other types of clothing when she has the chance. Her choice of clothing are always the type that she can easily move in, and would only wear constricting clothes in special occasions. History: Silvia wasn't born the same way as other children. For one, she had two mothers, a succubus and a vampire (Namely Zienna Eroheim and Celia Darkson), and no father, and she wasn't adopted either. She was born from dark energies released by said mothers during a moment of intimacy that formed a heart that soon took the form of a young girl who looked to be around the age of five. The next day, she was discovered sleeping between her mothers, and while it shocked the two of them, the energies she resonated quickly made her mothers realize what had happened. While her creation wasn't natural and her growth was almost non-existent, she was still treated like how a child should. She wasn't spoiled too much, but she was given most of the things she asked for. When it came to raising her, there were only a few disputes as her mothers had their own way of raising a child, but because Zienna didn't care too much about raising her as a succubus, Silvia's upbringing was mostly to Celia's desires, although Zienna stepped in time and again to make sure she wasn't deprived of her succubus linage, and to also help her control that side of her. A few months after her birth, Silvia was introduced to Lucia, a creation of her mother Celia who would act as her sister, and to Morgan, Aunt Marigold and Uncle Roy's daughter. She bonded really close to both of them. At the age of four, she met a new friend that was around her age. It was the son of an islander and the personal bodyguard of her Aunt Marigold. Mara was his name, and they became close friends. But when it came time for her to train her powers, they needed to do it in a safe location, and so she was brought to her mother Zienna's homeworld of Limbo where she met with Zienna's parents for the first time. She was welcomed with open arms and showed the same love she had been used to. Here, Maya and Jedo, her grandparents, stabilized her body, soul, and mind since the nature of her creation would have caused problems for her in the future. She stayed in limbo for years, making friends with the local demons and celestials that made the village their home while she stayed there. They were certainly different than her other friends, and it took some getting used to. They had different customs, some of which may not have been welcomed in the other worlds, but she had come to enjoy it. After completing her basic training, she was ready to go out to the other worlds to further her studies. She could have explored Limbo a while longer, but she had missed a few people where she grew up in, so exploring Limbo would have to take a back seat. She was signed into the academy, headed by her cousin, who she had a long history with. They had gotten along quite well as children, maybe because of the simple reason that her cousin wasn't born under normal circumstance, albeit she was... planned.